There's no placebo effect in animals, and that proves which alternative therapies work, even for the most dreaded disease, cancer. Bill Andrews wanted you to have this information, reasoning that it applies to dogs but with a grin, my husband pointed out that people are no less important. Stomach cancer (gastric carcinoma) is extremely aggressive, average survival less than six months. That is with standard chemo and radiation. This true story documents cancer healing through energy medicine, photonic laser devices and medical therapies that "cured" or at least put his cancer in remission - until we stopped the therapy. Read that again. His doctors repeatedly asked “What are you doing?” but they didn't really want to hear about alternative therapies. So Bill told me "Write it, there’s someone else who needs to know there are alternatives..."
A COPD patient with 24% lung function (due to on-the-job chemical inhalation) Bill had learned to live with that when he began having symptoms diagnosed as gall bladder attacks. Gall bladder surgery did not help. When I took him to emergency for unknown internal bleeding, he was discharged after four days in ICU and four units of blood. No diagnosis. Only three weeks later the cancer perforated an artery in his stomach. His job foreman rushed him to a hospital only two blocks away or he would not have survived the bleed-out. The fact that conventional medicine had failed, that he had not been diagnosed despite over six trips to emergency and multiple hospital admissions was the first lesson in self-preservation. That led to "alternative" medicine and in particular, what is now loosely called energy medicine. Four weeks after cancer surgery, he began chemo but stopped after three treatments resulted in three hospitalizations. Radiation was ordered but on the first trip to Asheville, the machine broke down and everyone was sent home. The next week, the girl that operates the machine was sick. Everyone was sent home. The third week they said he would have to be re-calibrated before beginning radiation. That extraordinary series of events was a message. My husband stopped all conventional treatment, sought alternative therapies, and began to get well! A friend called on Christmas morning 2003, seven weeks after Bill’s cancer surgery. 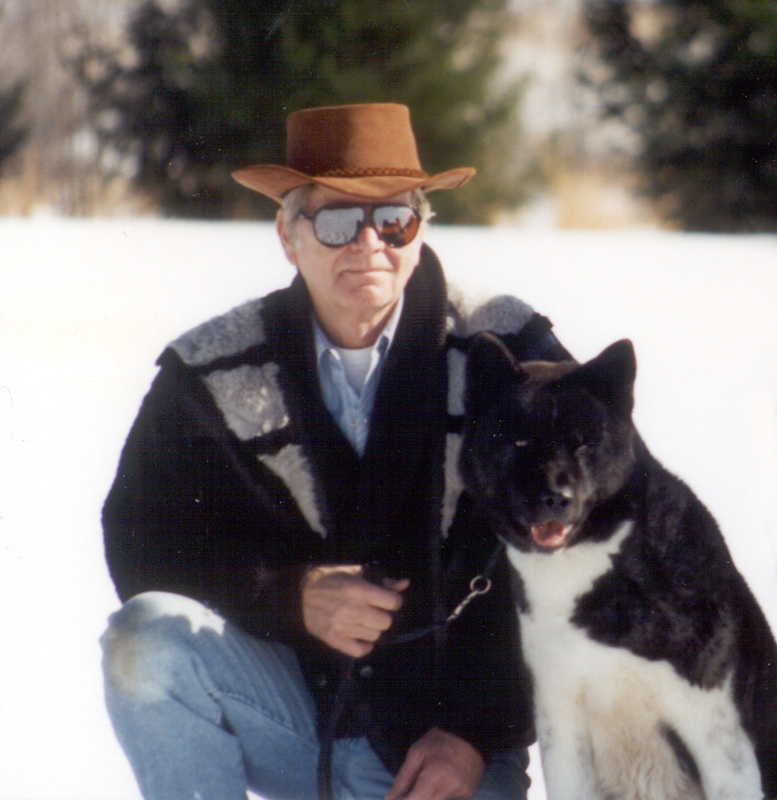 The Dorsetts had bought Akitas from us and a twenty year friendship outlasted their active involvement in showing dogs. Dave is one of the most intellectually gifted people we’ve ever known, an astute student of metaphysics. That "Merry Christmas" call became a two hour crash course on Rife Technology - the science of applied frequencies. Dave Dorsett opened alternative doors we didn't know existed. We hope no one reading this has a compelling motive to explore Energy Medicine but perhaps someone you know is facing imminent death. Cancer patients are so distraught (and drugged) that it’s difficult for them to absorb any information, especially a new concept. Discussing "alternative medicine" with a doctor is impossible. One quick example. Bill's oncologist said he needed Coumadin, one of the most-prescribed "drugs" today. Said it would keep the blood from clotting the port-a-cath, an opening in the chest through which transfusions and chemotherapy could be inserted directly into the main artery. I asked "Isn't Coumadin rat poison, also called Warfarin?" He ignored me but Bill forced him to admit they are exactly the same. So I asked "Well then, why can't he take vitamin "E" which also thins the blood plus it has many medically proven health benefits?" Avoiding eye contact, the oncologist agreed. In most states, a doctor can lose his license for recommending any alternative to surgery, chemotherapy and radiation. Imagine the conflict for physicians who have taken an oath to do no harm but are compelled to recommend only that which could kill the patient. The inarguable conclusion for that reasoning is money. Piles of it. The average cost per cancer patient is $600,000 or more (in 2005), depending on how long they keep the patient alive. For most cancer patients, conventional medicine provides immediate (legal) pain relief, drugs, and palliative treatments covered by insurance. Alternative medicine is usually as effective, as in marijuana for nausea, but it is not covered by insurance. You know why if you have explored the pharmaceutical company info in the health section. Morphine drips and pills for pain are not only covered, they are urged upon the patient. Did I say it was a racket? Surely not. I discovered that "alternatives" such as homeopathy, naturopathy, chiropractic, herbalmedicine, and more recently, energy medicine are affordable and effective. "Applied Energy" is already being appropriated by conventional medicine, i.e. Sloan Kettering and MD Anderson Cancer Treatment Centers are using "Energy Medicine." That's because people are looking at natural cures, herbals, and other alternatives instead of relying only on prescriptions that carry high risk and high cost. 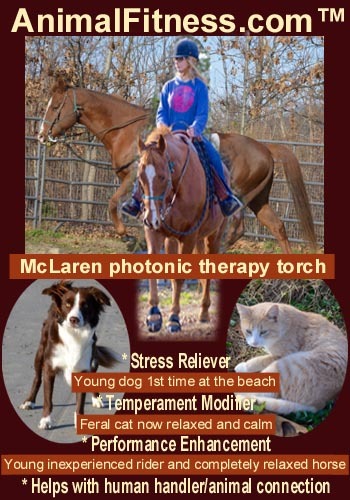 One "energy medicine" example is Photonic Therapy developed by Brian McLaren, DVM, B.V.Sc., Q.D.A.H., P/G Dip. (I.V.A.S.) Grad. Dip. Acup., M.App.Sc. We learned about the “torch” through friends who taped a TV show, ordered the gadget, tried it on their animals, and then invited us over to “learn something new.” RFD-TV showed a horse led into the round pen, limping badly, classic pain signs; ears laid back, tail whipping. As Dr. McLaren treated him while explaining the therapy to the audience gathered around the fence, the horse's tail stops lashing, ears sag to the side, eyelids droop and finally, the ultimate sign of total equine relaxation - the lower lip hangs loose. In less than twenty minutes, that horse walked out of the ring with absolutely no sign of a limp! Irrefutable evidence that something miraculous just happened! Of course we ordered it. That torch stopped Bill's asthma attacks and vomiting episodes, preventing what would previously have been trips to emergency. The photonic torch also prevented many trips to the veterinarian but that's another story. The combination of centuries-old acupuncture points stimulated by 20th Century LED technology is an incredible, effective alternative. In 2012 my vet ordered a $26,000 LED machine. Her use of CAM (Complimentary and Alternative Medicine) is why she's my vet but her gullibility on price worries me. Energy medicine is basic science. You don’t have to conduct clinical trials to know that an opera singer shatters a glass by hitting a certain frequency. Magnetic Energy is even more powerful. A tiny crystal powers your cell phone, runs your wristwatch, etc. Crystal rocks could probably run your car! Google Machu Pinchu in Peru for a mind-blowing lesson in earth's energy. Electrical energy, passed between two small pieces of ordinary copper pipe, kills parasites in the bloodstream. Dr. Hulda Clark was an internationally respected authority on biophysics and cell physiology until she had the audacity to step outside the tight circle of conventional medicine. She invented The Zapper and among other alternative "heretical" disclosures, she authored a book titled The Cure For All Cancers . Note the significance of her title. No one, not the Sloan-Kettering cancer center or the American Cancer Society dares to make that claim. They don't cure cancer, they treat it. If Alternative Medicine Works, Why Did He Die? That is the most important part of Bill's message to you. We were sitting quietly on the deck, enjoying a glorious sunset, watching the dogs run and play. Bill turned to me and said "the cancer is gone." A PET scan two weeks later, confirmed it. Incredulous, Dr. Thomas McCloud, his surgeon and friend, said "Buddy, I don't know what you're doing, just keep at it." We should have listened. You don't fix the roof when it isn't raining. A million such platitudes can't excuse how stupid we were. Bill was buying more equipment, expanding our plumbing company. We bought a new motor home. Life was good so we became complacent. Discontinued the alternative health protocols. The next year, his surgeon ordered a follow up PET scan "just to be sure" It did not reveal any cancer but they found a blood clot in his leg. Huh? We only stopped by for the PET test on the way to Sam's and Costco. The doctor did the "if you walk out of this hospital, you could drop dead!" dissertation. We were scared. Weak. He admitted Bill for surgery. Surgery went well but other things immediately went wrong. Bombarded with pain meds, catheters, antibiotics, and stress, Bill began to go downhill even before he came home. The dormant cancer attacked his over-burdened immune system. It was sudden and merciless. After another hospitalization, he was discharged into home hospice where he died in November 2005. So the message is twofold. There are medical alternatives for just about anything that ails you and when you find what works, stay with it. Try IV chelation therapy. Bill's pulmonologist nearly killed him with increasingly dangerous prescription drugs. I say "nearly" because when he told me to get our affairs in order, that "Bill won't last six months", I fired him on the spot! I called Dr. Ted Rozema, a medical doctor who practiced "alternative" medicine in SC. Bill went regularly for I.V. chelation but it was pricey and when his COPD got better and he went back to work, he quit going to S.C. for the half-day treatment. Get the message? If you can keep your eyes open and brain working, you can enjoy good health. Respect the doctor who respects you and your interest in complimentary or alternative therapies. Keep in mind that every medical procedure, every prescription, was once experimental. Even the life-saving surgical procedures that save millions of lives were once considered unproven, radical and risky. Above all, manage your own health care. It was Bill who pointed out that there is no placebo effect in veterinary medicine. Natural, alternative, herbal, energy medicine; call it what you will but animals let us know what works or what doesn’t. Hindsight is as illuminating as 20/20 vision. About that COPD. That was the diagnosis recorded by an emergency room physician when Bill's helper took him there after they left a six hour plumbing job at Dow Chemical Plant. The gigantic complex is hidden away in a remote mountain community that welcomed its economic impact and was blind to the environmental risk. That was only one of four extremely sensitive facilities our company serviced under contract and tight security. Bill had never, ever had a breathing problem. In the emergency room that day, "asthma" became part of Bill's medical record. The lung damage advanced into COPD, a catch-all term for lung disease. Did the local hospital knowingly cover up the results of that chemical spill? Of course. 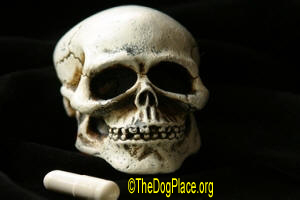 We will begin putting more human health information on TheDogPlace.org as time permits. For now, I hope my husband piqued your curiosity and you won’t wait until there’s a crisis to begin learning about alternative medicine, including food and herbals. Bill Andrews was the most noble person I ever knew. He wanted me to help others, including the animals we both loved. publisher's note: This 2005 article was updated and brought forward in July 2012. It wasn't easy to re-visit the past but I did so because of Dr. Roberta Lee's cancer diagnosis. She was our medical writer who became a close friend. Like Bill, she wants me to tell you that today, more than ever, we should explore medical alternatives and procedures which may increasingly be denied and which will certainly become more expensive. I've done my part. I hope you never need to know this but if you or someone you love needs help, well, remember where you saw this. TheDogPlace.org is easy to find on the search engines. Be well. Diagnose and REPORT allergic reactions, to protect your dog. 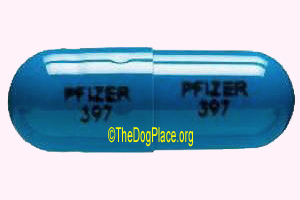 AKC / Pfizer partnered in 2012 after AKC introduced 2006 pet insurance.